Read the Feral Pig Diaries: “Day 1: Moonshine and Teen Swine” is here; “Day 2: Do Hogs Like Supermarket Danishes” is here; and “Day 3: OK, but How Does Wild Hog Taste?” is here. We piled into my car and drove out to Jackson Arms, a shooting range within spitting distance of San Francisco International Airport. (File this fun fact away for your next layover.) Once inside, Adam passed a quick test so we could rent a few guns and a rifle lane—novice shooters like me must be accompanied by at least one experienced marksman, house rules. I was the only novice in the crowd: Adam is a Navy veteran and grew up around guns, and Mac was a great marksman in college. Yes, this Ruger 1022 semiautomatic rifle is very one-if-by-land compared to the AR-15. 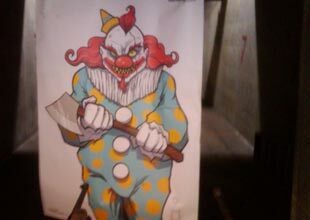 At first I was aiming pretty well, hitting the evil clown target (see below) right between the eyes. But by my fourth round or so, my beginner’s luck had worn off considerably. Also, I was freezing; the range was, for some reason, like a meat locker. Mac and I decided to go warm up in the lobby for a minute. I took out my granola bar and asked the guy behind the counter if it was okay to eat it, at which point Mac tweeted, “Kiera to attendant: ‘Can I eat my granola bar in here?’ #MotherJonesGoesToTheFiringRange!” Then, as I was eating my granola bar I noticed a sign about how you should always wash your hands after handling ammo, and I started worrying about whether hunters inadvertently give themselves lead poisoning. 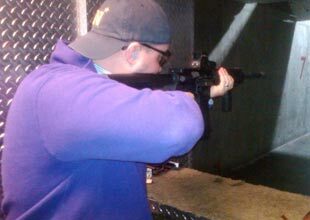 Like Mac said, #MotherJonesGoesToTheFiringRange! Unfortunately I don’t have a video of Mac and Adam shooting, since my phone is the opposite of smart. 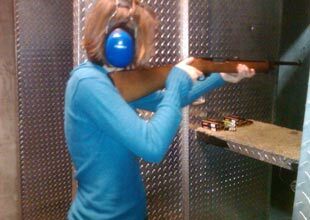 But this one, which Adam took, shows me shooting and Mac sweeping up some bullet casings and generally looking cool. No doubt many of you guys agree with my dad, and you’ll probably tell me so in the comments section of this post and elsewhere. (I’m looking at you, Vegansaurus!) I don’t mean to be flip about any of this. If we do end up shooting a pig, Jackson has generously offered to show me the whole butchering process. We’ll try to make use of the entire animal. I’m not sure how I’ll feel when I’m actually on the trip, but I’m going to be thinking a lot about ethics. I’ll be chronicling the whole thing here on the Blue Marble. Let’s call it the Feral Pig Diaries.